Our moto is to change their life by giving them education, confidence and employability. We commit placement opportunity to 100% candidates and a selection of minimum of 80% of the trainees in and around the state covering major cities. Also district towns and H.O will be explored for local employment opportunities. Backward integration for captive requirements will be established with leading national, regional and local industries for ensuring that the trainees are provided with job opportunities after completion of the training programs. 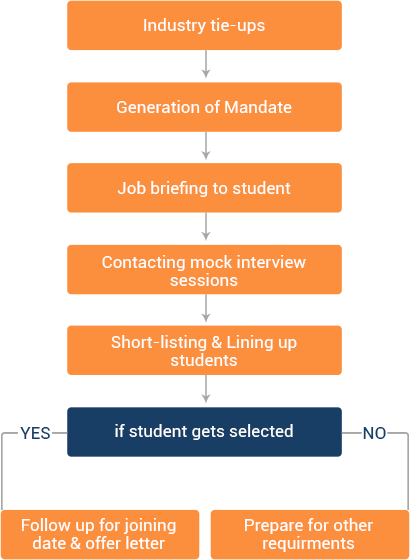 01 Placement opportunities for entry level job openings across sectors. 02 Self Employment / Entrepreneurship for specific programs. During the training: The candidate shall experience the industry interface during the training period in his/her respective trade through guest lectures by industry leaders and representatives, industrial visits to probable places of work post training, and, mentoring and guidance support for Trainees. During Placements: Interaction with deployment site during placement for employment and traineeship. Generate Industry mandates from the nearby locations for various programs.